The song “FOLLOW” is an infusion of Afro and highlife blend to give its listeners an appealing feel of the great music, and most importantly retaining its message. “FOLLOW” is produced by David Oke (AGS) and mixed by Izzy. 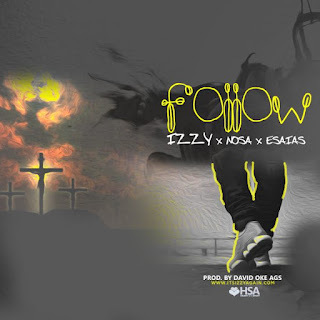 IZZY releases another amazing piece titled “FOLLOW”. This song also houses his friends, the evergreen and amazing music minister, NOSA (from Nigeria) and the talented Ghanaian urban Gospel rapper, ESAIAS. The US-based Nigerian Gospel minister is very passionate about Jesus as he sees Him to be the foundation of every believer’s life. It is his prayer that anyone that hears this song will always see the need to turn to Jesus for every and anything. You be the life wey I dey live. Medi n’akyi s3 best man ne bride’s maid, Wey dem dey follow ayefr) plus Da husbee . O.J, who say Oluwa no dey? Oh yeah all day Oye ade3 yie (the FIXER) is bae, hey! De3 m’ani ahunu no (what my eyes have seen) dem no no o No no no no!